Mount Hotham has the second biggest vertical rise of any Victorian ski resort and great backcountry skiing and boarding – at Loch, The Razorback, the Swindler Shutes and so on. But it also has a huge potential in its ‘side country’ – those areas adjacent to the Great Alpine Road but outside the official runs. 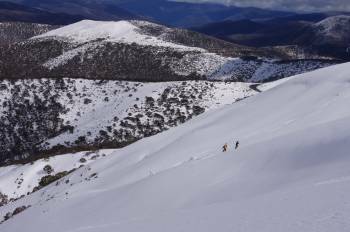 Many of these are great for either a short trip rather than a long-ish ski or walk in, or when the weather means a trip out to Loch or Feathertop is hard or impossible. The following is a quick assessment of what’s on offer along the Great Alpine Road, which follows the high ridge line between Harrietville, past Hotham itself and out towards Dinner Plain. It has been re-ordered (Aug 2011) so as to be a little more user friendly. It now starts at Rene’s Lookout and finishes at Little Higginbotham, so each section is a little further along the Great Alpine Road as you head from Harrietville towards Dinner Plain. There are still some obvious gaps in this guide. Comments and additions are welcome. If providing text on new runs, please email content plus an image if you have one to cam.walker@foe.org.au – thanks! In the gully below Eagle Ridge. Mt Blowhard. Great parking, and a short walk/ skin in. East facing slopes tend to hold snow well. There are two main gully systems and the southern ridge. The runs get steeper/ harder as you head south. Eagle Ridge. An easy glide from the top of the Gotcha lift. South facing, so holds the snow well into spring. Again, has a variety of terrain, from easy in the head of the gully to steep and sometimes nasty off the highpoint of the ridge itself. Mt Loch. Again, easy access with a Hotham pass, less than 15 mins from the top of Orchard, or about 80 min ski/ skin from the Loch carpark. Mostly east facing slopes with some good long runs. Avalanches. 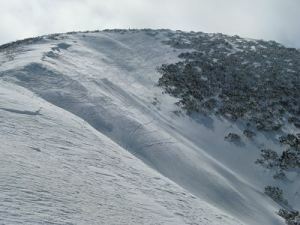 As we have seen in the winter of 2014, avalanches do happen in the Australian mountains. 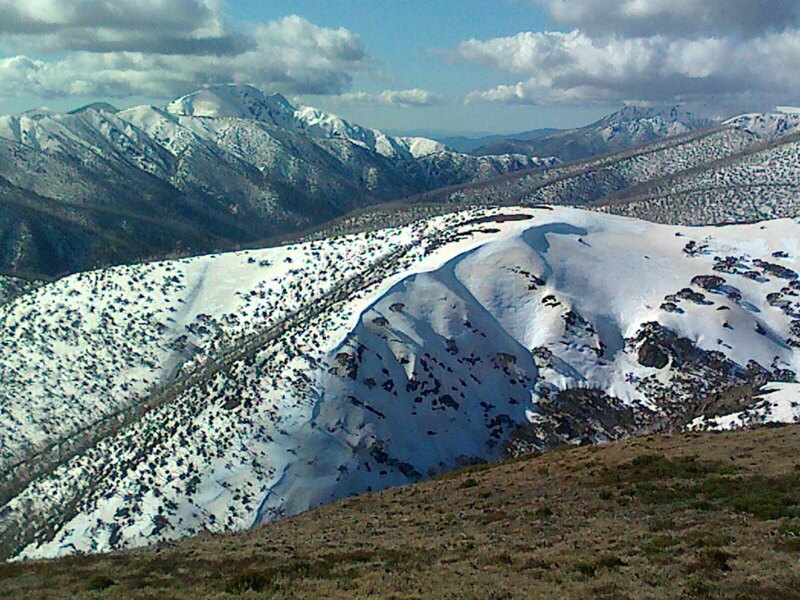 In the Hotham area, those slopes that are most prone to slides (to the best of my knowledge) are the southern and SE facing bowls of Mt Hotham itself. But in the right conditions, almost any terrain can slide. Be aware of the various forms of danger (cornices giving way, wind loading after storms, new snow instability, weak layers in the snow profile, etc). Variable conditions. In a resort, ski patrol will have assessed slopes before people get out on them. In the back country you need to be able to read terrain for the type of snow you’ll be on. Altitude, aspect (whether a particular slope faces to the sun or is sheltered from direct light) and prevailing winds (which may for instance scour snow off wind affected slopes and push fresh powder onto leeward side slopes) all influence the snow you’ll be on. If possible, visually scope a line before committing to it. On the first run down a new slope, ski/ ride conservatively so you’re ready for any sudden transition from snow to ice, etc. Use the Mountain Sports Collective website to get a sense of weather and snow conditions before heading out. You should always also check the daily reports from the head of the Hotham ski patrol, Bill Barker. Bill includes a backcountry summary in his report on the resort runs. To contact the Hotham ski patrol, call resort management on 03 5759 3550. Most of this terrain is within the alpine resort, meaning you need a day pass to park a car which you now need to organise on-line via the Alpine Access website run by Mt Hotham management or from one of the staff in the Hotham Central carpark. Parking can sometimes be an issue because apart from Baldy Hollow, the Wangaratta ski lodge car park, the saddle near Mt Blowhard, and the area that’s cleared at Diamantina hut (south end of the Razorback) there is sometimes not many graded spots to pull over. Be aware of where you park in terms of visibility for on coming cars, and potentially getting in the way of the snow clearing machinery. It’s way better to park and have a bit of a walk to the runs than get a ticket or trashed car from snow and rock debris from the snow clearing …. If you are interested in this area, its best to do a test drive through the length of this higher section (only about 5 – 6 km in total from Blowhard hut to Hotham village) to get a sense of the lay of the land and where the safe parking is. Remember to keep a shovel in the car in case you get plowed in by a wall of road cleared snow! If you are driving up from Harrietville, this is the first high point with a good open slope and will appear on your right after the drive up a steepish hill after the CRB road clearing depot. Easiest access is from the saddle after the climb up from Dungey’s Hollow (sign posts mark it as Chain Bay 2), where there is a sign saying ‘CRB Hills’, where you can usually get off the road with a park on the left. Cross the road and head ESE up through the trees, swinging south as you gain height. There are some really nice generally shorter runs off the summit ridge and also (snow permitting) down the north eastern slope that takes you back to the Alpine Road. This open area facing towards Hotham is the steepest section and you can sometimes get a park at the base of the face if you don’t mind a steepish climb up. The eastern side of Mt Blowhard (in the sun). The slopes to the right of the summit are directly below the Blowhard hut. This is a great spot – east facing, generally very well suited to intermediate skiing, but with steeper options off the far southern end of the mountain, and good parking at Blowhard hut. In spring, when the view from Hotham village suggests there isn’t much snow on Blowhard, there can still be some good skiing/riding in the two main gully systems. Access: park on the obvious long straight stretch where you will find Blowhard hut set back slightly on your right. There are signs saying ‘Chain Bay 1’. From the hut, head south along the road, then follow the ridge straight up to the summit point. The main face of the mountain has great slopes, with two main basins which face east. The Blowhard hut area (looking towards the slopes to east of Blowhard hut and through to South side of Mt Baldy). If you continue to the far southern end of the summit ridge, there is a nice ridge off to the south east with intermediate level skiing/ boarding, or a considerably steeper run straight down the southern face. If you ski this face you can simply walk back up the Alpine Road back to your car when you get to the bottom. The west face of the mountain is steeper but is cut by the Great Alpine Road, so is mostly rock cuttings. The slopes below the road are generally very steep and tree covered, but possibly worth a look when the snow base is deep if you’re suitably experienced and don’t mind a serious stomp back out to the road. (These are the slopes to the east of Blowhard hut through to the South side of Mt Baldy). The bowl-like valley between Mt Blowhard and back to Mt Little Baldy is a sub-branch of the headwaters of the Dargo River (the headwaters itself drain off the Australia Drift/ south face of Hotham). This section provides some excellent mid level skiing, with some harder and steeper patches. It is south and east facing, meaning it will often be in good condition when things are burning off on top of the mountain, and it collects spindrift after big storms, so a fresh morning after heavy snow can be ideal for an outing. There are three main ‘sections’ of this basin, each separated by snow gum woodland. Access: Coming from the Harrietville side, the Alpine road passes Mt Blowhard, then Blowhard hut, then up the hill and over the high exposed area of Little Baldy. The slopes are best accessed by parking in the open flat area by Blowhard hut (Chain Bay 1), if there is space, then skiing/ walking back along the old road (which shows as a clear pathway cutting through the snow gum and running mostly parallel to the sealed road, and then dropping in as you get to a spot you like). Sometimes you can also get a safe place to park up on the highpoint of the road where you pass over the summit of Mt Baldy. east face below Blowhard hut. From the hut, head direct east through the trees until it opens upbelow you. Sections of this are quite steep. east face near highpoint 1692 m about 200 metres due north of the hut. As you head through the trees north from the hut you will emerge into the open and on your right you should see 2 tall snow poles, which act as a ‘gate’ to the slopes below. This has some steep sections as well. The easiest section is the broad gully at the northern end of the slope, as the slope hits the top end of the basin – almost up as far as the Little Baldy skyline. gully at far north eastern end of the basin. This is directly south of the Baldy summit and can sometimes be accessed via a small pull in car park as you drive out of Baldy Hollow towards Blowhard hut. It is the steepest, most serious section of the three areas, with some small bluffs and a more regular scattering of trees. 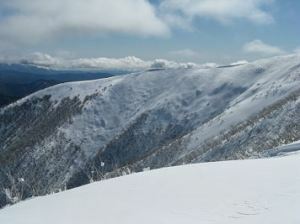 Mt Little Baldy (in front) and Hotham (out the back) from Mt Blowhard. The clear steep gullies on the left of the Baldy ridge are what is called the ‘east face near highpoint 1692m’ mentioned above, while those to the right (and actually in the middle of the picture) are called the ‘gully at far north eastern end of the basin’. I have seen one sizeable snow slide on the central (east face) gully, so take care. Being east of the main ridge, these slopes are often out of the weather on a windy day. The northern slopes of Little Baldy. The gully mentioned in the text is obvious in the right of the picture, with the dark cliffy section to its immediate left. Access: As you drive in from Harrietville, and you have gone past Blowhard Hut, the road crosses the high point of the ridge (Mt Baldy) and then goes around Little Baldy and into Baldy Hollow. You can either park where you can pullover as you go over the highpoint (there is an obvious look out from here) or keep going to the Hollow. This big hill is north facing, mostly forested and quite rocky, so only worth a visit when you get a new cover over an established base. But on those occasions when it is in condition, the main gully that runs directly north from the small saddle immediately west of the summit is great. Be aware that if you ski directly off the summit and head NW towards the gully, there is a sizeable cliff on the ridge line. Best to avoid it by dropping into the gully straight away rather than following the ridge – it keeps getting steeper until you hit the cliff line. The gully is initially broad and then splits where it is separated by a narrow ridge of rock. The right hand gully/ shute (when standing at top of the slope) is steeper and narrower and has some rock protruding, so take care. Below the rock ridge the gullies re-join and enter low trees. From here the easiest way out is to kick steps sidling uphill and roughly due east back directly to Baldy Hollow if you have parked there, or up and right following the line of least resistance to reach the Great Alpine Road again. 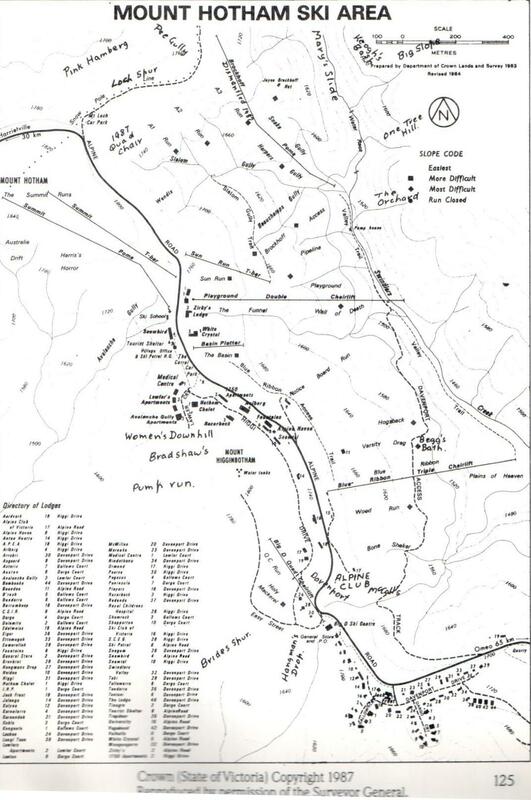 This map should help locate some key areas, including Dargo Bowl (where the map says ‘Dargo River), Australia Drift to the right, and Avalanche Gully on Mt Hotham. Also shows Bon Accord Spur and Derrick Col. Many thanks to VSG for the map. This is gaining popularity with boarders, who have realised you can just cross over the summit from the top of Summit Run in the resort, have a great run down the face, then get your mates to collect you at Baldy Hollow. from Hotham village, up along the summit lift line, then following the access trail to Australia Drift, then on to the summit, where there is the big cairn and fire lookout. the carpark at Diamantina (probably the longest climb) back up towards the summit. From the summit, head SW (you should see a few snow poles), till you get to the narrow belt of trees. It will steepen as you drop into the trees and as you exit you either have the steep open gully straight below you, which eases slightly as you get lower, and often has a good run well into the trees, or else veer right towards the ridge line, where a less experienced skier/ boarder can cut big turns in less difficult terrain. Exit via a climb back up to the Alpine road at Baldy Hollow. 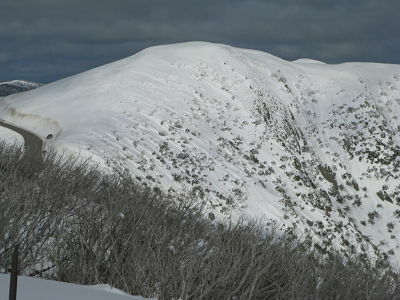 The southern face of Hotham. The South West face gully on left, then Dargo Bowl (down from the summit; H Gully is the gully coming into the bowl from the Drift Lift side). 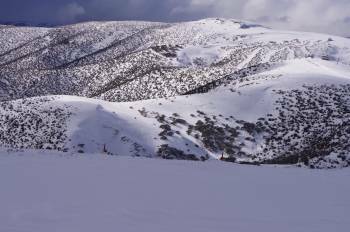 The next one to the right (between Dargo Bowl and Australia Drift), is Dargo West Face, which drops below the ridgeline in the front. 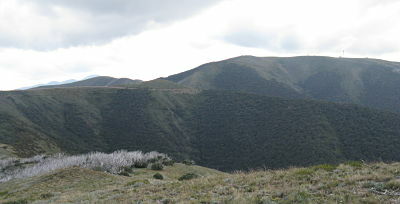 Australia Drift is the slope on the far right of the mountain itself, with Hotham central further over on the right hand skyline. Thanks to Graeme Nelson for extra details on these slopes. If you head due south from the fire tower you will find yourself in a broad but deep gully system that will close in and then open again as you drop into the trees. This is the Dargo Bowl, and getting back out is via a climb back up to the summit (or if you have a lift pass, climb out via the ridge on your right as you look up hill, then traverse across to the base of the Drift T bar lift). To the east of Dargo Bowl is the Dargo West face. This sometimes has a ‘roll over’ point that can sometimes slide. Further over, towards the Hotham ski village is Australia Drift. See the photo (above) of this section of the mountain for extra details on these areas. Be aware that avalanches do happen up here. There are various cautions when skiing/ boarding this side of the mountain: firstly because the south west face/ gully faces into the weather, it can be very wind affected and icy. If you are heading down the obvious direct spur towards the road at Baldy Saddle, be aware that there is a cutting/ cliff at the very end – if you fall off this in poor visibility you will end up right on the road! Slide avalanches are not entirely uncommon in the three main gully systems across this side of the mountain. 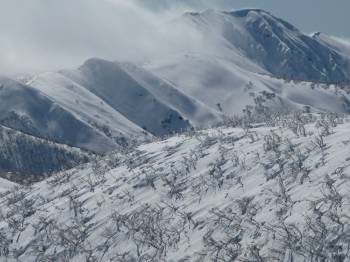 This high and exposed ridge that leads from Hotham to Mt Feathertop has some serious terrain and should not be taken lightly. 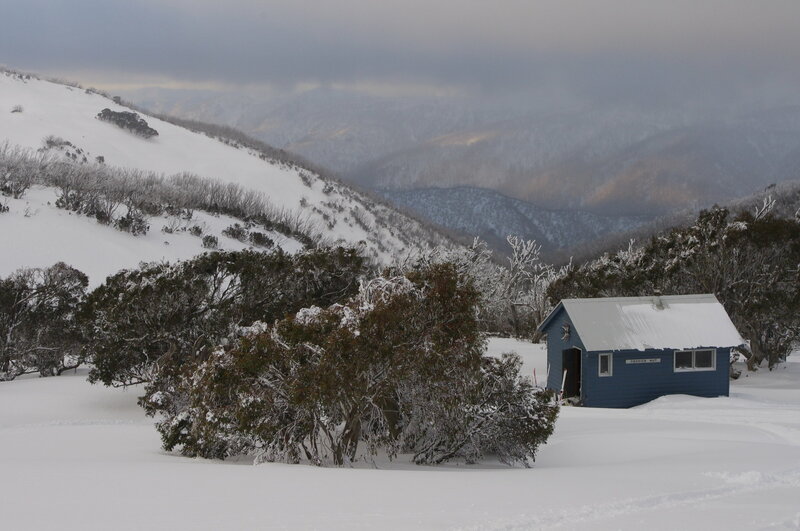 However, the southern end of the ridge offers some good and protected runs within a short walk or ski from the car parking spot by Diamantina Hut. The further you go the longer the runs become. Some of the ridgeline here will have cornices so take care in poor visibility. The easier runs tend to be closer to the road, with some serious and extreme skiing on the higher and exposed third of the razorback closest to the summit. Out here much of the mountain is prone to icy conditions (even in the early afternoon, as the sun drops to the west side of the Razorback) and there are a number of large cliffs. Graeme Nelson, an extremely competent skier, died in a fall while in the East Face gullies during the winter of 2011. If you’re wanting to just walk/ ski a little way along the start of the Razorback, the south face of the Bon Accord Spur also offers some great runs. On slope. The top half is fairly gentle , being north facing its a great slope to ride on a sunny morning after a freeze as it softens quickly. A few tree runs on the ridge which collect drifts after a storm, clear and gentler sides to the spur and into the adjacent bowl and a small collection of rock ledges and drops to amuse yourself on as you move north down the ridge line. Looking towards Eagle Ridge from the Great Alpine Road. In addition to the various runs on the ridge, you can see ‘Pee Gully’ (not mentioned in text), plus the run to its right, which is how many people climb out after skiing/riding Eagles. Thanks to VSG for this image. Eagle Ridge in spring conditions (2012). You access the slopes from the right, from near the top of the Gotcha and Keogh lift line. This is the short ridge that runs westwards from the top of the Gotcha and Keogh chairlifts. 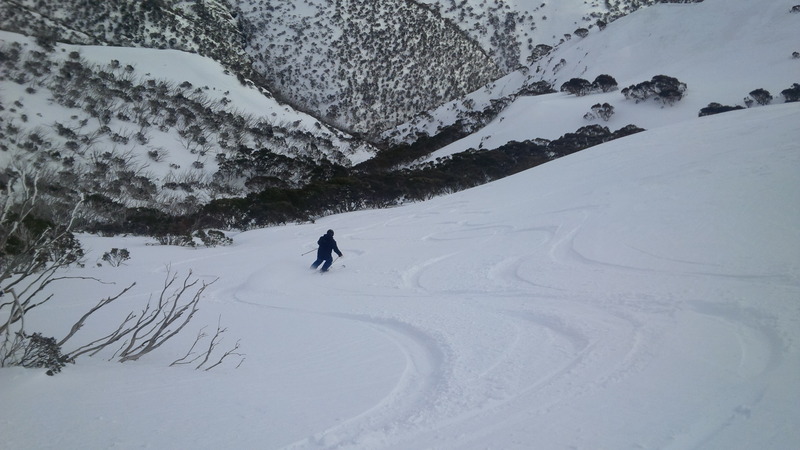 Its a very short ski from the Mt Loch carpark or the top of the Heavenly Valley chair if you have a pass. Just ski down the slope from the top of Heavenly and then veer left in the saddle, staying above the tree line. If you ski 200 metres along the obvious ridge that heads towards the Razorback you will see south facing slopes below you. They are easiest at the head of the valley and bigger and steeper as you go out to the obvious highpoint (which often has a small cornice). If you go over the highpoint and down the ridge for about 200 m there is an additional steepish slope on skiers left. It is visible in the picture above. Being predominantly south facing, these slopes can hold some good snow well into spring. Eagle Ridge is in the centre of this image (Razorback out on skyline). You can see the cornice that often forms above the steepest part of the Eagle Ridge runs. If you follow the ski trail that skirts the edge of the resort from Loch Carpark towards Mt Loch, you go past the Gotcha and Keogh’s chair lifts, then descend onto a long ridge (past runs like Tele Treat). This is called Derrick Col. A short climb from here takes you through a nice unburnt section of snowgums, and an obvious hill top before you ski past the top of the Watershed and Chirons runs to the top of the Orchard chair. As far as I know this hill is un named. From this hill you have great views up to the summit of Mt Loch. Below you (as you look north) there is a deep bowl and gullies that climb up to the Mt Loch ridge. These have some nice skiing/ riding when the conditions are right. The easiest way to access the long gully if you have a lift pass is to catch the chair to the top of Orchard. Go under the ropes and skirt out to the north west, staying high and traversing, until the gully opens up below you. After the run, you can then climb straight up to the unamed hill, drop into Watershed/ Chirons and catch the Orchard chair back up again. Otherwise, if you’re coming from Loch carpark, just skin almost to the top of Orchard Chair but veer skiers left as you get close until you’re at the top of the gully. This takes a little more effort to get to, with a ski/ walk of several km from the Loch carpark (or the much shorter option of access from the top of the Orchard chair if you have a Hotham lift pass). There are three sections to this mountain: the East face, Machinery Spur, and the south eastern flanks. 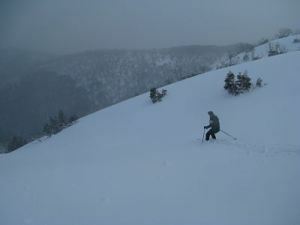 There are good runs off the eastern slopes below the summit and out along the northern ridgeline towards Machinery Spur. The eastern side of the ridges are mostly open and can collect spindrift nicely after a storm comes through. For details on options on this mountain, check here. This is the continuation of the ridgeline which runs north from the Mt Loch summit. 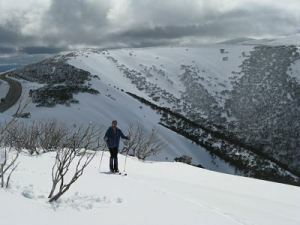 North west of Mt Loch there is some great skiing along Machinery Spur. Simply follow the ridge line north from the summit of Mt Loch. The most obvious runs are on your right (the east side). The first bowls have the longest runs, from intermediate to advanced, then just along a bit is some nice open treed runs for the intermediate skier. The next bowl heading northwest is quite nice again for the intermediate skier. From the top of this bowl head along Machinery Spur towards Red Robin mine, following the 4×4 track to a saddle, then a short walk or skin up to the summit will get you to some shorter steeper chutes. It’s about a 20 min hike out from the tree line. 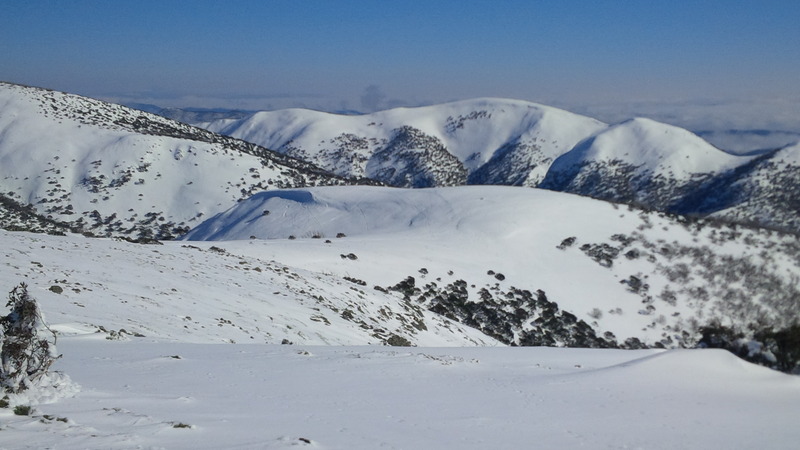 It’s a full day ski touring to the furthest chutes past Red Robin mine, with great views to Mt Feathertop. From here it’s a 1 hr skin back to the Orchard chairlift. The slopes on the south eastern side of Mt Loch, above the Cobungra River. Apart from the eastern faces mentioned above, there are some nice runs to be found south of the summit on the south eastern flanks of the mountain. If you follow the pole line from the top of the Orchard chairlift towards Derrick Hut, you initially descend a short slope, then cross an open area as you veer away from the pole line that leads to the in-resort runs at One Tree Hill. At about pole number 63 leave the pole line and head due east. Over the rise you will see mellow slopes falling towards the headwaters of the Cobungra River. The longer and slighter steeper slopes are on skiers left. 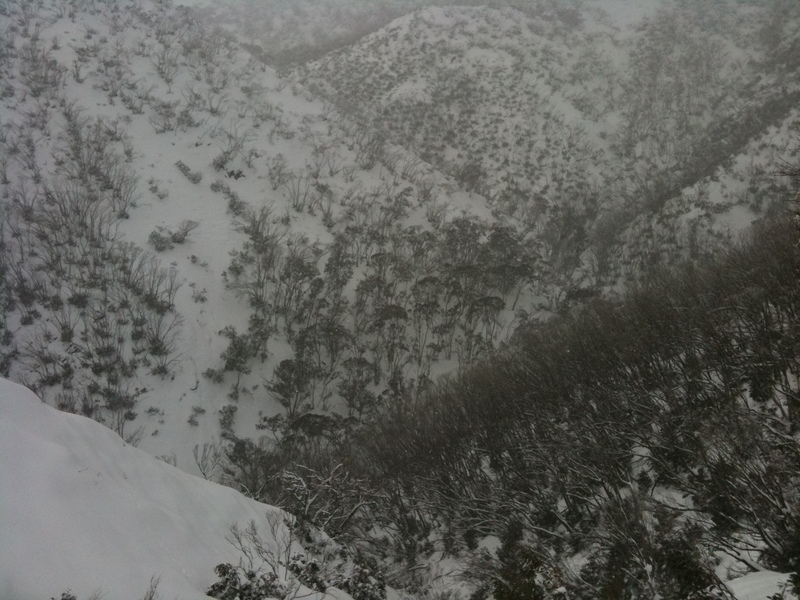 This is the big gully system directly below the Mt Hotham Race Club building at the base of the Summit chair lift. It doesn’t get more side country than this: where else can you boot out and order a beer at the top of the line? Most people seem to access the gully from the base of the Australia Drift tow. There are some cliffy sections, and also a bowl that normally has a cornice, so check what you’re doing. If someone felt inspired to send through some more detailed notes, please check the end of this section for contact details. Map shows the location of Women’s Downhill. Thanks to Peter Agnew for this scan from Donald Bennett’s book ‘Hotham Horizons’, p 125. .
As I understand it, Women’s Downhill was partially cleared at one point (1920s?) with the intention to turn it into a lifted run. 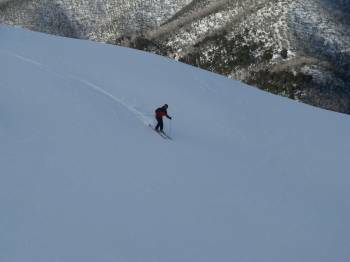 There are a number of named runs in the general south facing area between the Central Hotham village (beyond the Alpine Heights lodge) and The General. Of these runs, Women’s Downhill is the best known. The easiest way to access is from the top of the Big D chairlift. Once you get off the chair, you’ll see the towies hut in front of you. Cross over beyond the rope and have a look around. You’ll see the terrain pretty easily below you. 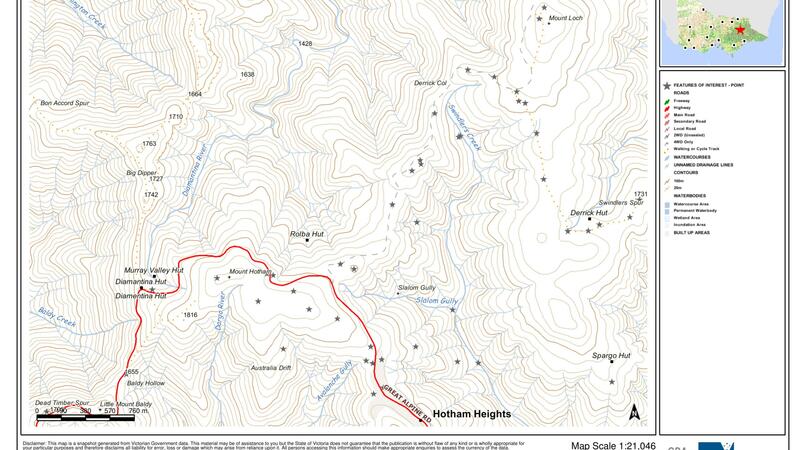 There are two ridges that go west/ south west from the summit of Mt Higginbotham, right down into the Dargo Catchment. To get onto Women’s Downhill (WD), head into the obvious open bowl below you between the ridges, then veer slightly skiers left through the trees and the steeper WD run will appear below you as an obvious cleared line. Facing the way it does, the top of the ridge can lose snow cover fairly quickly, but when its good on top, the snow cover tends to be excellent all the way down the bowls and ridges, often holding skiable snow down below 1400 metres asl. Be aware that there is one potentially dangerous route here, skiers right of WD, which is steep and very narrow in the bottom section. This old map of the resort shows some of the runs in the Women’s Downhill area. looking towards the eastern slopes of Mt Loch from near Derricks hut. This nice hill sits at the eastern end of the resort, above the Davenport village. The hill starts just near bustop 8. It’s a short steep climb up from the road, just take the line of least resistance, often the ridgeline is wind blown, so easier than the sections that gather snow drifts. From the broad, narrow summit plateau, there are some good runs off the south and south eastern slopes. 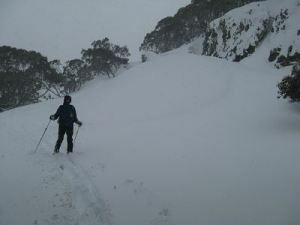 At the bottom you will hit the Hotham – Dinner plain ski trail, so getting out is easy. This slope also offers some great gullies further downslope if you veer around to the left as you ski down. In the section between the last lodges in Davenport village and the Whitey and Slatey carparks, there are two broad valleys facing southwards. The first one is right behind (south of) the road works depot at the eastern end of the village, before Corner carpark if you are coming from the Hotham side. It faces mostly east. The second one is very close to where the Hotham – DP ski trail crosses the Alpine Road (bus stop 10): just ski up towards Hotham village for about 80 metres and the slope will open up below you. This site faces southwards. 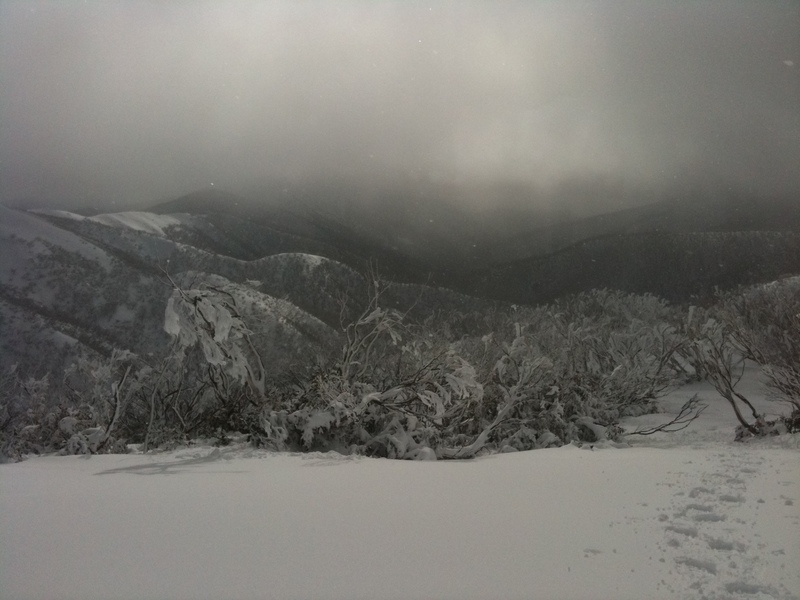 You can access both these open systems directly from the Hotham – Dinner Plain ski trail. They have a similar aspect to the Swindler Shutes (sometimes called the Workshop Shutes) out on Mount Loch near Derrick Hut. This means they can hold powder snow when other areas are getting sun affected. Its also fairly low and makes for a great little outing when the weather is nasty up on Mount Hotham itself. Because this area is so close to the village, there are no parking problems. You can access them via the village bus. Please feel free to send updates and additional info to cam.walker@foe.org.au for inclusion on this page. Any updates or extra info on names of features and lines is always appreciated. Good summary of the road accessed sidecountry. I disagree however with you designation of Australia Drift – I reckon Aus Drift is the valley below the Drift Lift, separated by a ridge from Avalanche Gully and then the resort. 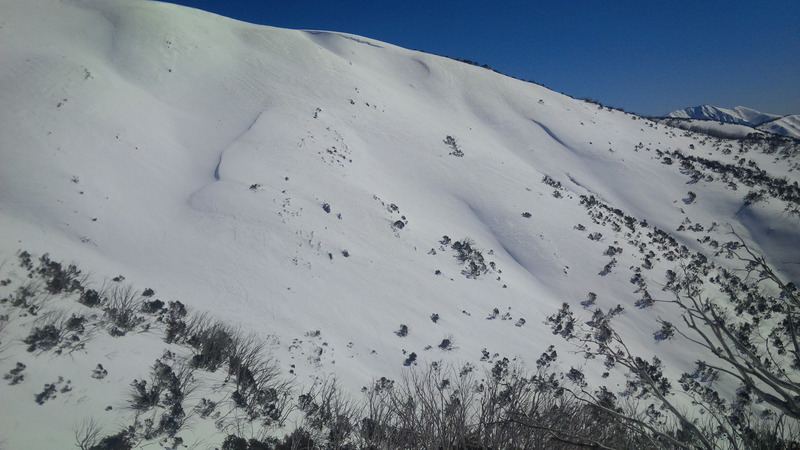 The two areas you identify as Australia Drift I know as Dargo Bowl (down from the summit; H Gully is the gully coming into the bowl from the Drift Lift side). The next one (between Dargo Bowl and Aus Drift), I know as Dargo West Face. thanks. There are a few obvious gaps in this, like Pink Hamburg. I was planning to finish it off soon. But if you felt like emailing some text (and ideally a photo) I will add it to the feature. Thanks. G’day. Pink Hamberg is spelt Pink Hamberg. Cheers, Andrew Barnes. wow, great job, many thanks Cam. I often wonder how many folks go down Derrick Col (bowl & gullies to west of Mt Loch, accessible from Orchard Chair (with a short walk). It always looks so inviting in summer, and I always forget to go over there in winter. And then there’s Machinery Spur east face. Looks good and reads well. I first layer my eyes on the surrounding terrain back in 2001 or 2002, down from the NSW ski fields. Ive wanted to come back & lay turns down Feathertop & others since. This August could be my time (looking to mission down from Byron Aug.14th). Besides putting it out there for a bed exchange (Hotham or near by for Byron whenever), I’m also putting it out there to see who’d like to split board the backcountry with me & a few friends perhaps? P.S. I on this site because I’m searching for Splitboard hire, if anyone has any leads? sorry, not aware of anyone who hires splitboards in VIC. Might be worth checking in with Adam West from FirstLight boards in NSW to see if he can arrange something. Nice summary Cam. To this I’d definitely add The Twins which is one of the premier day ski tours in Vic IMO. You could also give honourable mentions to Mt Murray, Mt Freezeout and the Blue Rag Range. I don’t know if your hill has a name over and above ‘Golden Point’ – however some of the east facing gullies running down from it are supremo – including the gorgeous chute south of Spargos. And let’s not forget the Workshop Chutes! I could have a go at a map, but I wouldn’t want to betray too much! [Thanks Mike. I had thought that Murray, The Twins, Freezeout, etc might be more BC than side country, but good idea re extending the terrain. Was just writing some notes for the workshop chutes. If you felt inspired to do a map that would be great. Just include the stuff you want public!]. Thanks for the info. I’ve found it really useful. Great notes by the way Cam. There’s probably weeks of unique runs here if the snow /weather is right. The Twins are great day out if the snow is good down to 1400m, otherwise it can be a lot of on/off skis up to the main Twins Massif. The actual climb up the east ridge is takes about an hour. Once up top there’s lots of options to slide, from moderate to hellish. Perhaps 200 m vertical +/-. It’s a great spot for lunch as one admires the southern faces of Hotham and the summit ridge of Feathertop in the distance. Easiest retreat is short slalom turns down the old jeep track to the main Mt Murray Rd. Then it’s a simple if somewhat tiring return skin via St Bernaud.